When was the last time you stopped to think about the colours in the world around you? Your pen? Your car? Your clothes? How much time do you spend thinking about how they came to be the colours that they are? I’m going to take a wild guess here. If you’re anything like me, you don’t think about that at all. Every colour imaginable already exists as a part of the light spectrum. It’s not possible to add extra colours or discover anything new in absolute terms. But when it comes to the pigment of physical objects, that’s a different story. Pigments absorb and reflect different parts of the colour spectrum and it’s the extent that objects do that which determines the colours we see. And unlike the infinite possibilities in the colour spectrum, there are limits on the material pigments we’re able to create. Where Do Pigments Come From? Some of the pigments used in materials around us come from organic sources. They’re mined or harvested and incorporated into materials. But that approach is often expensive and difficult to scale for bulk manufacturing. The other main source for pigment is the mixing of inorganic materials, usually different metal oxides. But despite companies around the world investing in research to discover and create new inorganic pigments, only 5 or so have been developed and commercialized in the last 25 years. Durability and scalability are key factors in developing new pigments. Finding the right balance of material properties and interesting, new colours is no easy task. In fact, until recently it had been over two hundred years since a durable blue-coloured compound had been discovered. The last blue pigment was Cobalt Blue (a mix of cobalt and aluminium oxides) which was first produced in 1802. But more recently, a team from Oregon State University has stumbled on a new blue pigment. In the search for new materials that could be used in electronics, a graduate student found that one particular mix of oxides had a very striking blue hue. Mas Subramanian, who was leading the work, immediately knew that the new compound was a research breakthrough. “If I hadn’t come from an industry research background – DuPont has a division that developed pigments and obviously they are used in paint and many other things – I would not have known this was highly unusual, a discovery with strong commercial potential,” he says. 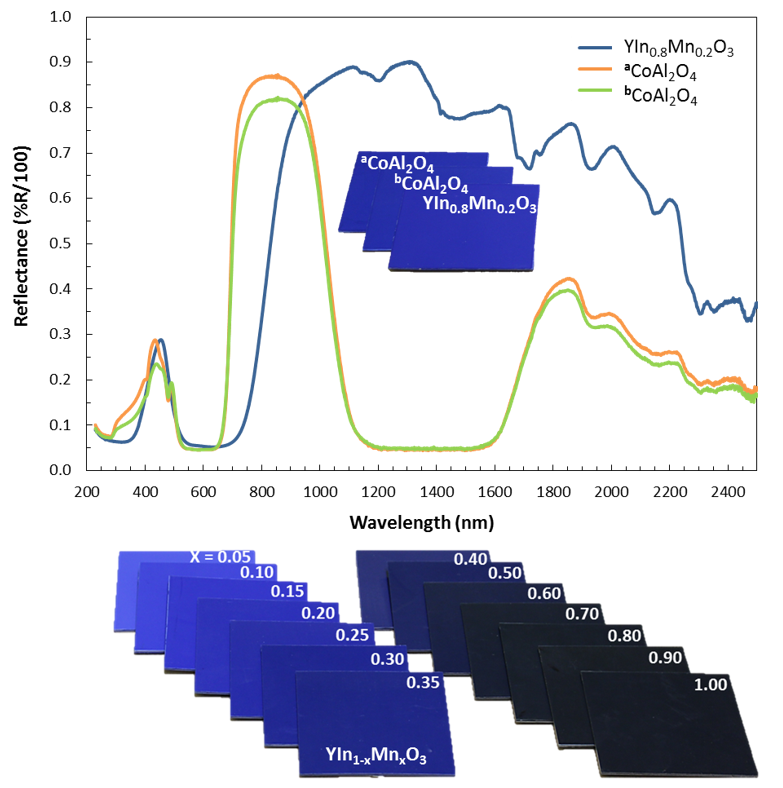 As well as it’s intense color, the material also exhibits high absorbance in the UV region and high reflectivity in the near-infrared region, which could prove to be especially important when compared with the performance of Cobalt Blue. These properties could make it well suited to a range of applications. And so this new blue, called YInMn Blue for now because of its chemical makeup of yttrium, indium and manganese oxides, has been patented and work to incorporate it in commercial materials is well underway. Its high reflectivity of the infra-red spectrum makes it likely to be well suited in materials designed to keep cars or buildings cool. That’s one of the first and most promising areas for commercialization so far. This discovery goes to show the importance of being open and observant to new things, intended or not. YInMn was not what this group were aiming for, but Mas Subramanian recognized this as an important discovery when they found it. I wonder how many others would have cast this off as yet another failure, and missed its potential altogether.